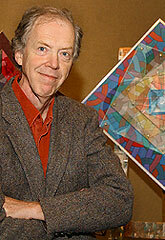 Art Green of the department of fine arts officially retires June 30, ending a UW career that began in 1977. Green is among faculty members featured in the breezy new annual report of UW's faculty of arts, just published. "Art's early work as a member of Chicago's 'Hairy Who' was influenced by pop art," the article says. "He played with stylized images of perfection and perception. 'I was always interested in idealized images; real ice cream cones never look as nice as the image of an ice cream cone,' he explains. 'Perspective and distortions of perspective strain our idea of what reality is.' Art's proximity to other Faculties has led to his current interest in geometric shapes." 'Celebrate Canada' luncheon buffet, University Club, 11:00 to 2:00, reservations ext. 3801. Ice cream party and magic show for staff and faculty, sponsored by UW Recreation Committee, 12 noon, has been cancelled. Career workshop: "Career Decision Making" 2:30, Tatham Centre room 1208, registration online. 'From Burma to Canada:' Hser Ta Kay speaks on "A Student's Life from a Refugee Camp to Waterloo", 5:30, Student Life Centre great hall, sponsored by WUSC. California alumni reception featuring Duffy Knox, BA 1986, technical director at Sony Imageworks, 6 to 8 p.m., Avalon Hotel, Beverly Hills, details online. 'Pilate' plays the Humanities Theatre 8 p.m., tickets $23.50 from Federation of Students or Humanities box office. Centre for Business, Entrepreneurship and Technology presents Liz Torlée, TerraNova Market Strategies, "Breaking Ground: Real-Life Research that Fuels Strategic Planning," Thursday 12 noon, Tatham Centre room 2218, reservations ext. 7167. Alumni in San Francisco reception at Stanford University Faculty Club, in partnership with Toronto, Ottawa and Queen's, Thursday, details online. Employee Assistance Program presents "Can I Get You Something To Drink?" Psychologist Darryl Upfold talks about effects and safety of alcoholic drinks in summer. Thursday, July 6, 12 noon, Davis Centre room 1302, register with Johan Reis, health services. UW's Elliott Avedon Museum and Archive of Games -- a unique Canadian resource dedicated to the research, collection, preservation and exhibition of games and game-related objects -- celebrates its 35th anniversary today. The celebration will recognize the support of the museum's founder, donors and members of the museum's board of directors and former staff, as well as funding from the heritage operations branch of the Ontario Ministry of Culture. The by-invitation anniversary event begins at 2 p.m. in the main foyer of Matthews Hall, outside the museum's gallery. The facility, opened in 1971, was renamed the Elliott Avedon Museum and Archive of Games in 2000 to honour the significant contributions made over many years by a now-retired faculty member who founded it (and who is still active in documenting its holdings). "Through the study of games, we can learn a great deal about human behaviour," says Ron Johnson, a UW professor of recreation and leisure studies. "Games reflect the cultures in which they were developed and played, as well as illustrating the diffusion and interaction of people throughout human history." The museum collection includes more than 5,000 physical objects -- many of which have been exhibited in the public gallery over the years. Private, public and corporate donations have supported the acquisition of artifacts from around the world. The museum's web site features photographs and documentary text about many individual items in the collection. Presented in the form of Virtual Exhibits, each web page includes one or more illustrations of objects in the collection. Many were photographed by the late Gerald Hagey, a keen museum volunteer in the years after he retired as the first president of UW. The museum is operated by the recreation and leisure studies department, staffed by graduate students and co-op students, and administered by the faculty of applied health sciences as part of the Waterloo Heritage Collections Association. The current exhibit is Animal Games, displaying a collection of about 50 card games, board games, puzzles, children's games and more, all based on animal themes. Visitors can learn about the history of classic games such as Snakes and Ladders, Monopoly, Rummy and The Uncle Wiggily Game. The free exhibit is open to the public. The museum is open 9 a.m. to 4 p.m. weekdays through August 25 and again in the fall term. Its next exhibit opens in January 2007, featuring games from 1957, in celebration of UW's 50th anniversary. “If Christian theology is particularly well suited to the task of bridge building in our increasingly fragmented world, then Conrad Grebel University College is particularly well situated to help build those bridges. It is an institution of the Mennonite church, firmly rooted in that particular faith heritage, which provides postsecondary education in a variety of disciplines to a broad spectrum of students on a large, diverse university campus. . . .
“’What I have appreciated most about the tie between Grebel’s residence and academic programs,’ commented graduating student Adrie Janzen, ‘is being able to see the professors live a committed Christian life while not being afraid to ask difficult questions about what they believe.’ . . .
“The College received a grant of $50,000 from the RBJ Schlegel Research Institute for Aging at the University of Waterloo to investigate the possibility of becoming a partner in the Institute by offering courses or programs related to the spiritual and pastoral needs of aging persons. Marianne Mellinger was appointed to lead this initiative in the coming year. . . .
“Grebel’s library has noticed how changing patterns of document storage and delivery are affecting usage. For example, wireless internet service is now available in our library. As streaming audio becomes more prevalent and is built into the delivery of courses, student use of library music resources is diminishing. . . .
“The number of international students is growing at Grebel, and given the University’s emphasis on internationalization, their numbers will likely continue to increase. That change presents both an opportunity and a challenge for the College. It’s one thing to work, study or travel in another part of the world, quite another to have the world come here. While this is a movement in the direction of globalization that we welcome, it is also one that we need to prepare for. Another challenge is the marked increase in the number of students with food allergies and restricted diets. . . .
Today's a milestone birthday for UW president David Johnston. When Johnston was reappointed two years ago, the chair of the board of governors, who made the announcement, noted that Johnston's age was taken into consideration. A memo pointed out that since he was born June 28, 1941, he would reach 65, normal UW retirement age, before his presidential term ends. It added that he would give up his tenure at that time. That 65th birthday is today, and Johnston recently confirmed that effective June 30, he’ll cease to be a tenured faculty member in the school of computer science and the faculty of applied health sciences. Johnston was originally a law professor, and continues active scholarship in the fields of securities regulation and communications law. He'll be 68 by the time he ends his term as president. UW stands to save some real money when the federal Goods and Services Tax drops from 7 per cent to 6 per cent as of July 1. The university's financial statement for last year doesn't show GST as a separate item, but it does indicate that UW spent some $113 million on supplies, services, travel and similar items during the year, and most of that would be taxable. So you do the math, bearing in mind that like some other quasi-public organizations, UW gets a rebate for two-thirds of the GST it pays and is really only on the hook for one-third. A memo from Jane Manson, the director of finance, went out yesterday advising departments that "the rebate amount will remain at 67% on purchases. The net GST cost to University departments under a 6% tax rate will be 1.98%, down from 2.31%." She provided some technical details on how to judge whether a transaction that's under way this week will be taxed at the 7% or 6% rate. And this note about vending machines: "Since GST is considered to be collected at the time money is removed from the machine, money removed after July 1 will be deemed to include GST at the 6% rate." Federal changes as of July 1 also mean changes in income tax rates and personal exemptions, including the new Canada Employment Credit on the first $500 of salary income. There's also the much-publicized new Universal Child Care Benefit of $100 a month for each child under 6. A nominating committee is being put together for the position of dean of science, which will fall vacant in July 2007 when current dean George Dixon becomes vice-president (university research). Maybe I'm not the only person confused about one aspect of the process, but I now have the accurate word: there are two positions for staff members on the committee, and they're to be chosen in different ways. One staff representative is elected by staff members in the science faculty; a call for nominations went out earlier this month, and the deadline is this Friday. The other staff member on the committee is chosen by the staff association, which has issued a call for applications. Mary Gerhardstein (left), a long-time faculty member in UW's department of English, died Sunday. A graduate of the University of Montana and University of Iowa, she came to UW in 1963, and retired in September 2001. For her last decade at UW she was also associate dean (undergraduate studies) in the faculty of arts. Visitation is scheduled for Thursday from 2 to 4 and 7 to 9 p.m. at the Edward R. Good Funeral Home on King Street, and a memorial service will be held at St. Bede's Chapel, Renison College, on Friday at 2:30. Memorial donations to the Grand River Regional Cancer Centre or to the UW Mary Gerhardstein Entrance Scholarship Fund are suggested. The east entrance to Needles Hall, at the top of the stairs facing the Dana Porter Library, will be closed for repairs for the rest of this week. . . . Flyers are publicizing a course on "The Musical Film", cross-listed as Drama 318 and Fine Arts 366, to be offered in the fall term. . . . The bookstore has a summer sale ("feel the need for a good read?") in the South Campus Hall concourse today through Friday. . . .